On 26th April we held a "pop-up" cake and craft sale at Safe Journey Home - thanks to all who made and bought things! More photos here. We had a stand at the Ideal Health Exhibition in The Exchange on Thursday 14th April 2016. 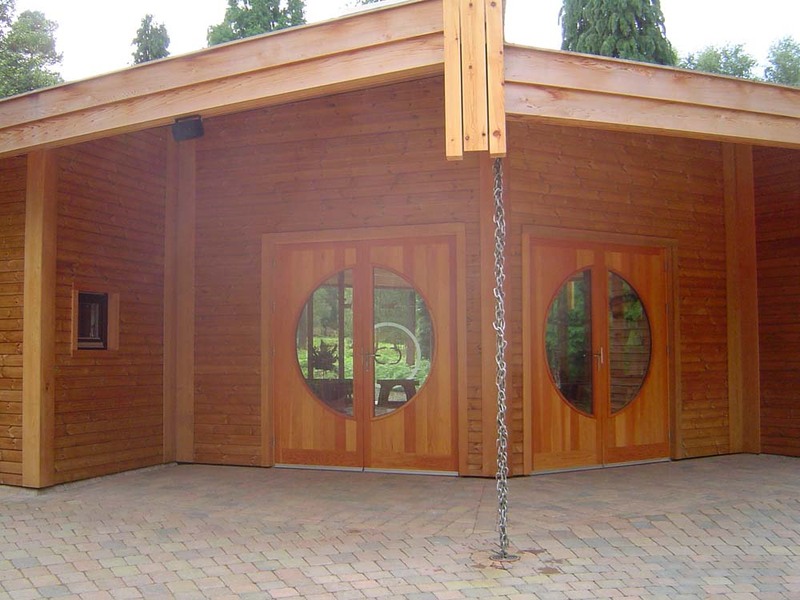 For more pictures see the Gallery. 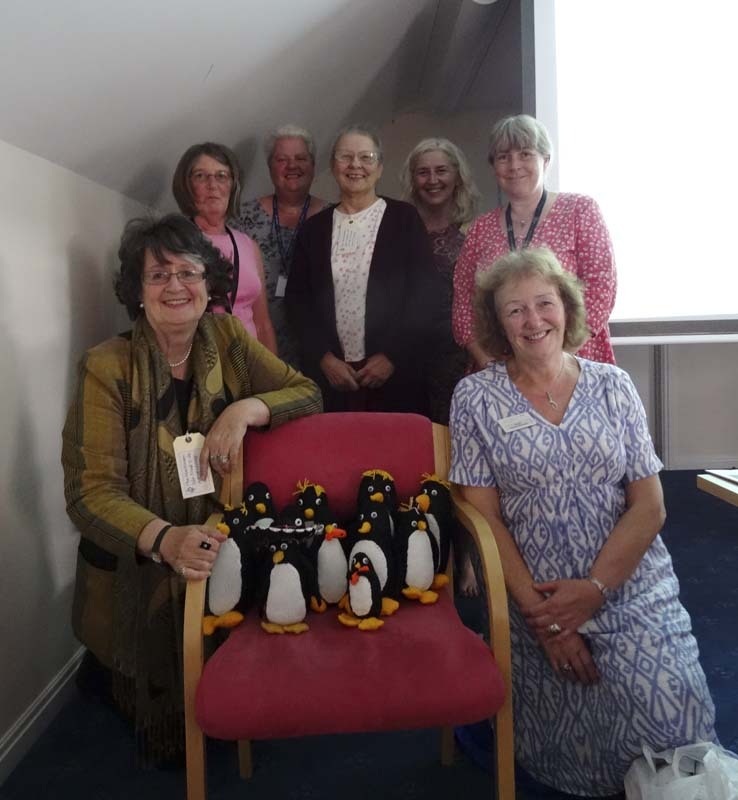 Knit and Natter's penguins are presented to the RVS for their local fundraising. 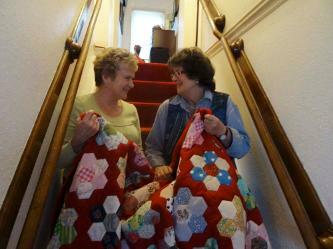 Sale of cakes and crafts created by the Knit and Natter group. Thursday 14th April, 12.00 - 7.00pm, at the Exchange, Sturminster Newton. The Martinsey Isle Trust will have a stand at this event - find us on stand 15. "Organised by the Patient Participation Group of the Medical Centre, this will be a fantastic opportunity to have many of your queries regarding various medical and well-being issues answered. As well as covering common health topics like Asthma, Dementia, Osteoarthritis, Stroke, etc. there will be stalls from Age Concern, St John Ambulance, Diabetes UK, Dorset Blind Association, Alzheimer's Society, Coeliac UK and many more, including diet, obesity, high cholesterol, and hypertension as well as holistic support." Friday 3rd July 2015. Meet at 11am at the entrance to the Trailway next to the Factory Shop in Stur. Walk across the fields to Colber Bridge and on to the Bull for lunch. Friday 17th July 2015. Meet at 11am at the entrance to the Trailway next to the Factory Shop in Stur. Minibus to Alners Gorse at Hazelbury Bryan to walk around Butterfly Conservation site. Lunch at the Green Man, Kings Stag at about 12.30pm, and minibus back by about 2.45pm. Friday 31st July 2015. Meet at 11am at the entrance to the Trailway next to the Factory Shop in Stur. Minibus to Shearwater Lake near Warminster. Time to walk round and have lunch at the cafe. Minibus will bring us back by about 4.30pm. Friday 14th August 2015. Meet at 11am at the entrance to the Trailway next to the Factory Shop in Stur. Walk along the Stour and through the woods to the White Horse at Hinton St Mary. Lunch at about 12.15pm. Minibus will bring us back by about 2.30pm. Friday 28th August 2015. Meet at 11am at the entrance to the Trailway next to the Factory Shop in Stur. Walk along Trailway to Fiddleford. Lunch at Fiddleford Inn at about 12.15pm. Minibus will bring us back by about 2.20pm. Friday 11th September 2015. Meet at 11am at the entrance to the Trailway next to the Factory Shop in Stur. Walk along the Stour to Hinton St Mary for lunch at the White Horse at about 12.15pm. Please let Judith know if you want lunch so she can give numbers to the pub. Leave about 2pm. (Wear sturdy footwear.) Dogs welcome. Friday 25th September 2015. Yeovil Country Park. Minibus leaving Factory Shop at 10 am. Leave Yeovil at 1 pm to come back to Stur. 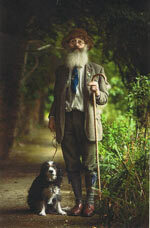 Dogs welcome on a lead. This was our last walk for 2015. 1st April at 10 am: Meet at the Trailway near the Factory Shop in Stur for coach to Shaftesbury town car park. Circular walk around Abbey Walk for approx 1 hour. Flat, easy walking (wheelchair available - please ask Judith in advance). Alternatively you may wish to shop/have coffee in Shaftesbury or viist the lovely church and crypt or museum. 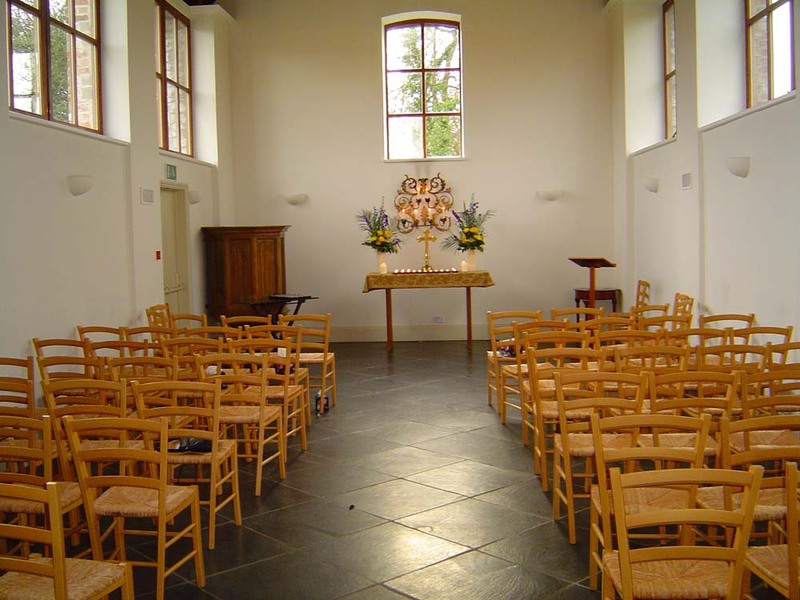 The coach will collect us from the drop-off point at approx 12 noon, and take us to Guys Marsh Prison's Jailhouse Cafe for lunch. Coach home at 2.10pm arriving at Stur by approx 2.25pm. NB: no dogs allowed in the Jailhouse Cafe. Suggested donation for coach: £5. 15th April at 11am: Meet at the Trailway near the Factory Shop. 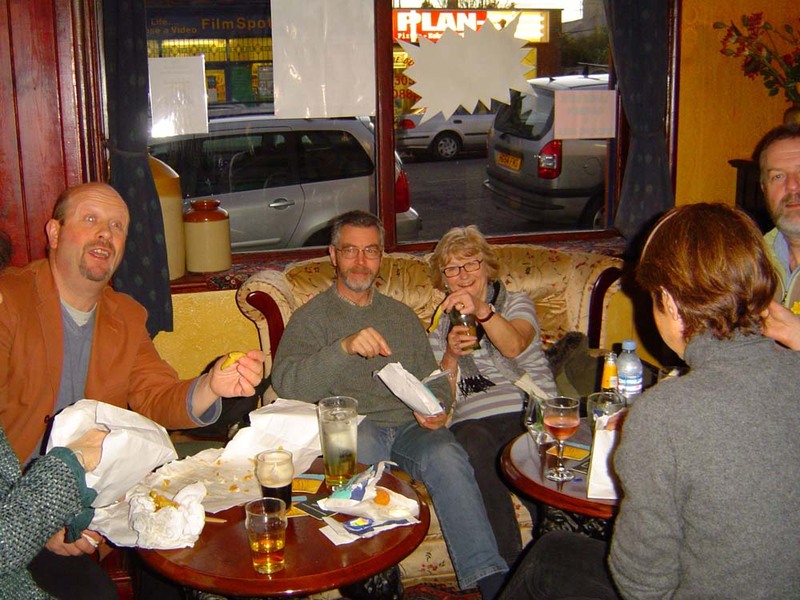 Informal walk along the Trailway to and from Fiddleford Inn with an optional lunch/drink rest at the pub. Dogs on leads welcome in the pub. 29th April at 10.30am: Meet at the Trailway near the Factory Shop for coach to The Saxon Inn, Child Okeford to order lunch. Short, easy walk to Gold Hill Organic Farm. Guided tour for approx 1 hour through fields and wooded area. Those who do not wish to walk could go to the farm shop and cafe for cake and drinks. No dogs allowed in the cafe. Loo available. Back to The Saxon Inn for lunch at approx 12.45pm. Coach back to Stur at 2.10pm arriving at approx 2.25pm. Dogs welcome on leads. Suggested donation: £3 for coach; £1 for tour. 13th May at 11am: Meet at the Trailway near the Factory Shop. Informal walk along the Trailway to and from Fiddleford Inn with an optional lunch/drink rest at the pub. Dogs on leads welcome in the pub. 27th May at 11am: Meet at theTrailway near the Factory Shop. Walk across fields and over styles to Fiddleford Lavender Farm. Bring picnic lunch. Jo will provide drinks and cakes in exchange for a donation to the Lavender Farm Project. There will be time to see the plants and Fiddleford Manor next door. Coach at 2.10pm to take us back to Stur by 2.25pm. Dogs welcome. Suggested donation for coach: £1.50. 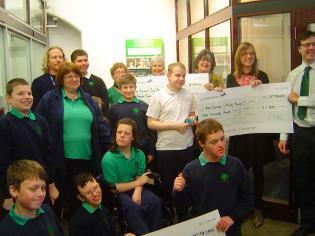 LLOYDS BANK COMMUNITY FUND PROGRAMME - THANK YOU! 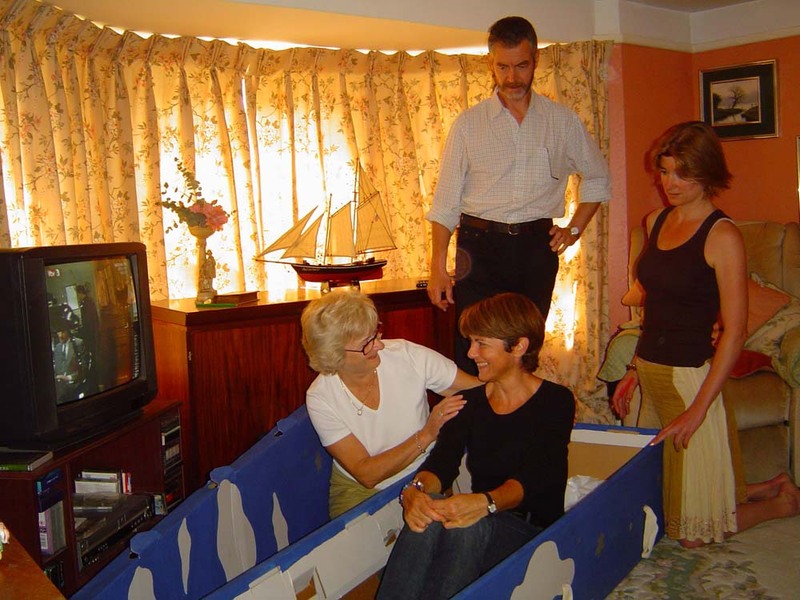 In November 2014, thanks to your wonderful support, we were awarded £2000, enabling us to continue our current projects, as well as to plan new projects for the benefit of our local community. We are so grateful to everyone who voted for us and for your endorsement of the valuable work we do. 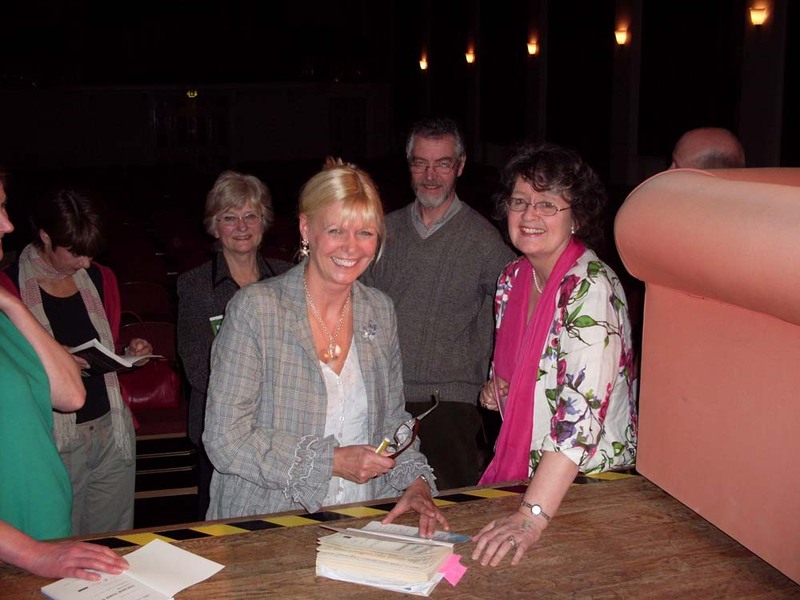 The photo below shows the winners with their cheques: Yewstock School (front and left), Heather and Judith for The Martinsey Isle Trust (back), Age Concern (right). Care for the environment and each other, help in later life, a "good death" and a supported bereavement, can all go hand in hand. Kindly joining our own volunteers were: Fiona, Ham Down Woodland Burial Ground owner; Cath, our local willow coffin and yurt maker; local floral artists and Helen from Williams Nursery; representatives from Age Concern North Dorset, Wayfinders (benefits advice), Julia's House, Weldmar Hospice and Mosaic (the bereavement charity for children). 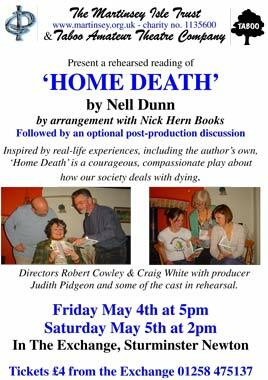 We were privileged that Nell Dunn (who attended our first performance) allowed us to perform a rehearsed reading each day of two characters from her play "Home Death", followed by a discussion by some of our contributors. This event was sponsored by Safe Journey Home. Click on the images below to see some of the displays from the Awareness Day. 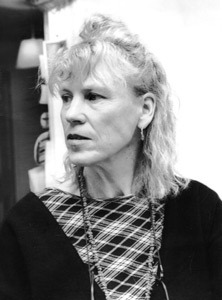 The part of Mary will now be taken by Anna Neville and Nell Dunn will join the post-production discussion in Glastonbury. 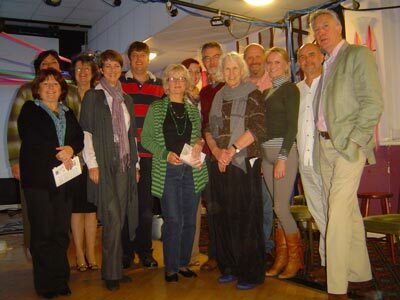 Nell is 4th from the left in the front row in the photo below. 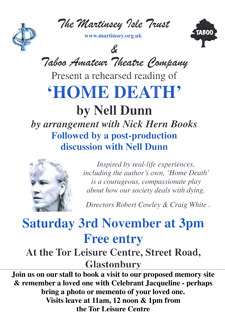 To discover more about the Taboo Theatre Company, please download the pdf file below (you will need Acrobat Reader). 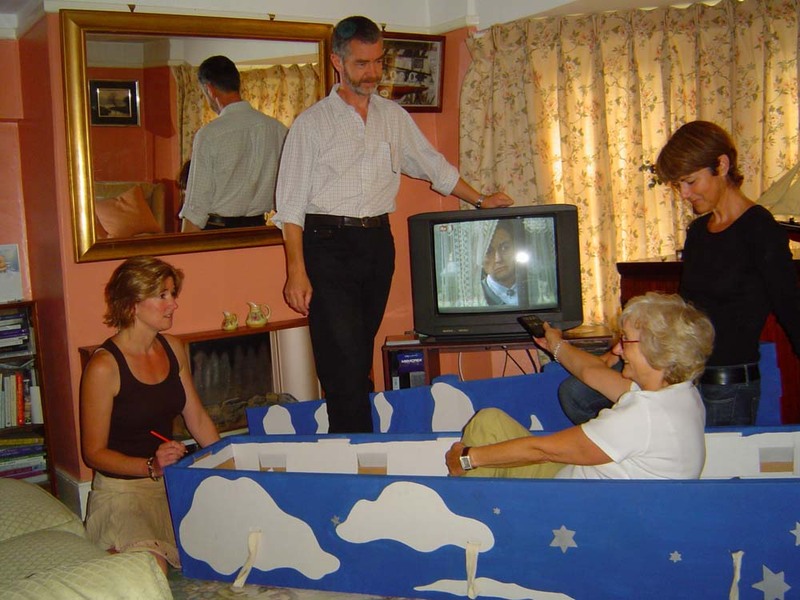 ONE chap sits in a cardboard coffin painted with stars and clouds, others crowd around the cast of Colder than Here asking if there are such places as woodland burial grounds while eating cake and sipping tea. It is rather surreal. 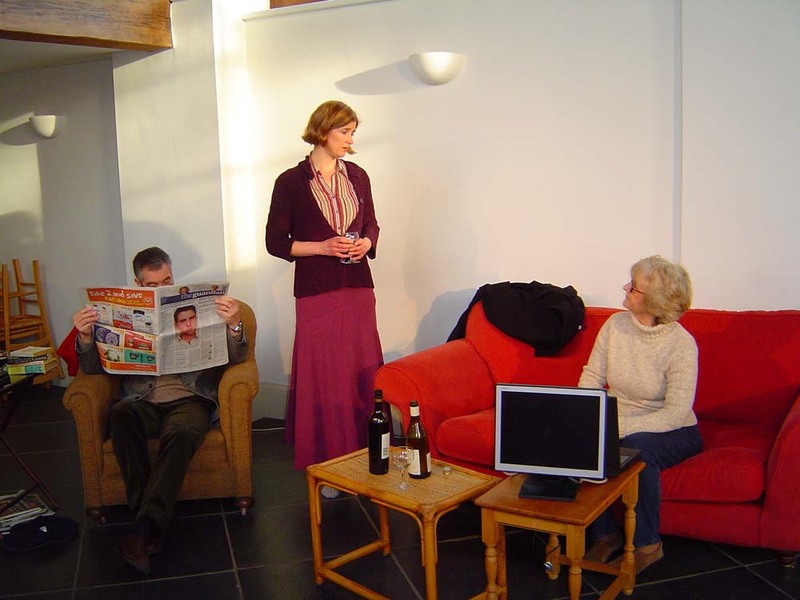 Sturminster Newton Amateur Dramatic Society's spin-off company Taboo has just finished performing young playwright Laura Wade's play about death and dying to prisoners at Guys Marsh Prison - it is also a cast member's birthday (hence the cake). 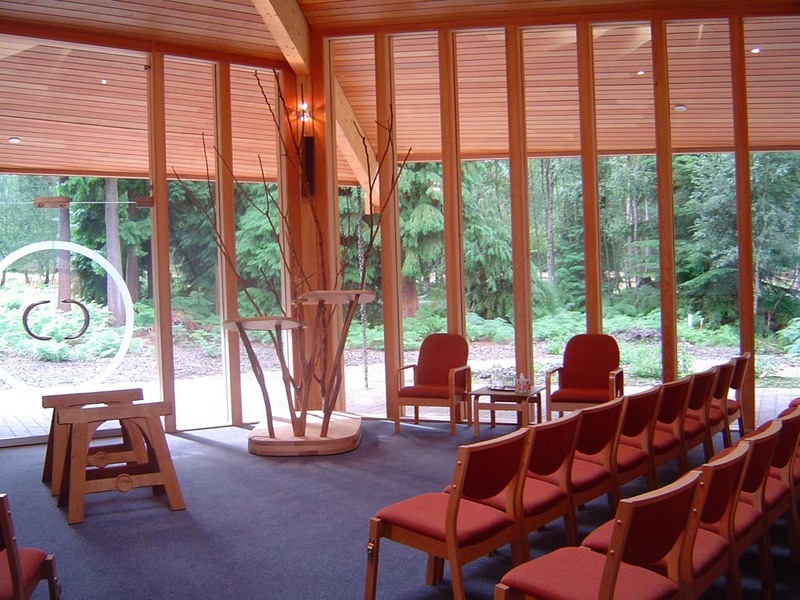 Producer Judith Pidgeon of The Martinsey Isle Trust explains that there are many natural burial grounds in the country that are a far cry from the often morbid, clinical funerals associated with crematoriums. Conversation turns to personal experiences. One inmate speaks of his loss. His partner, just 24, died of cancer. Everyone nods in agreement at the tragedy of a short life. Another man has already spoken out about the recent death of his mother from this terrible disease. This openness and discussion is exactly what The Martinsey Isle Trust (co-founded by Judith Pidgeon and David Wasley), prison staff and the performers were hoping for when they decided to stage the production within the prison walls. "One in three people know someone who has suffered from cancer", says Linda Cowley, who plays Myra Bradley, the one dying of bone cancer. 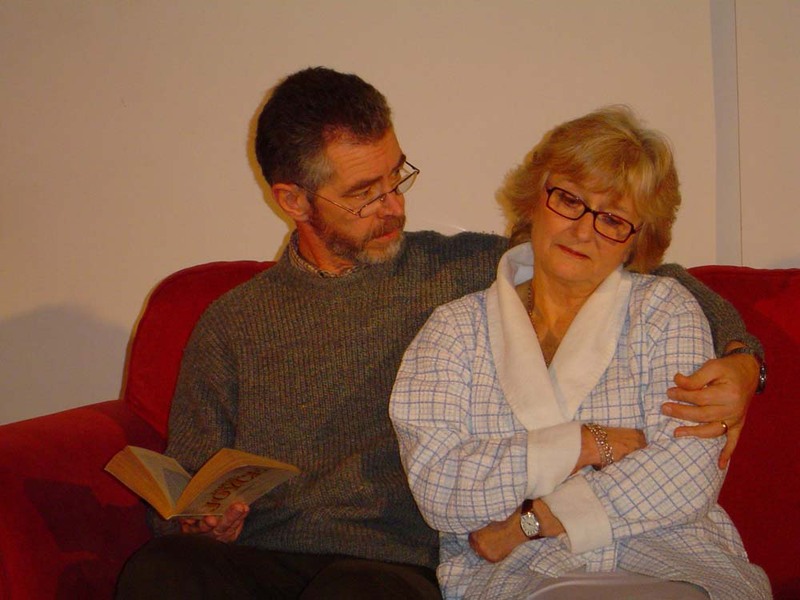 A SNADS regular, who usually appears on stage in pantomime or comedy, Linda gives an exceptional performance as a woman whose life is ebbing away. 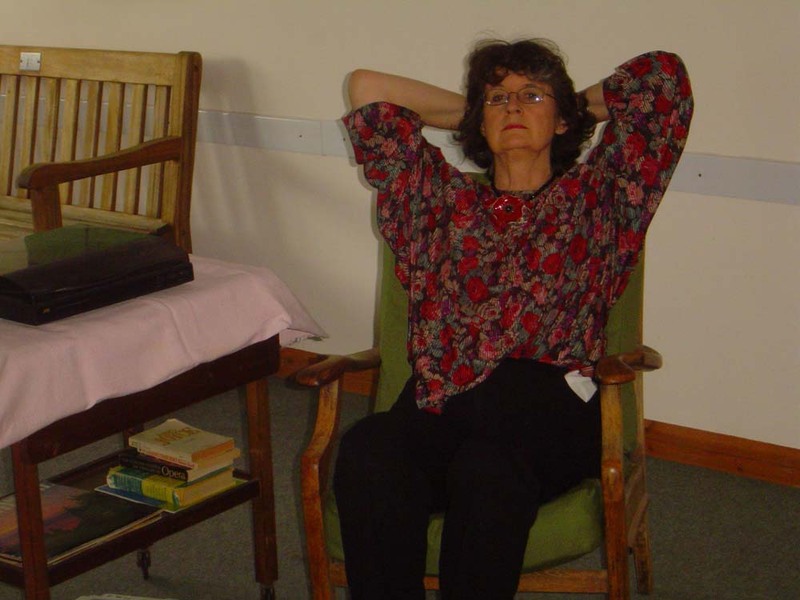 By the close of the play tears had formed in Linda's eyes, not for her challenging subject, it seemed, but because the 50-strong audience in the prison chapel had responded with such powerful applause - they had appreciated it. 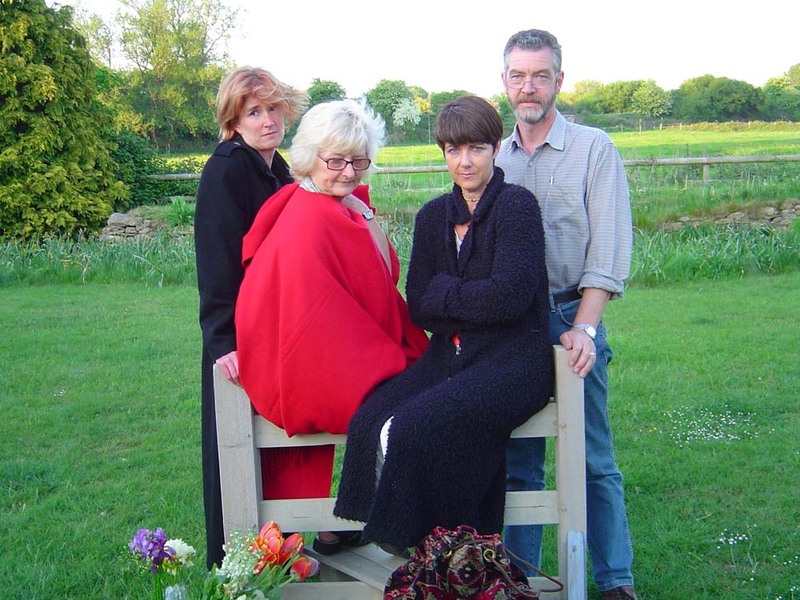 The play is about a family coping with cancer. Mother Myra may be the one suffering the illness but her husband and two daughters are affected by the sickness in their own ways. 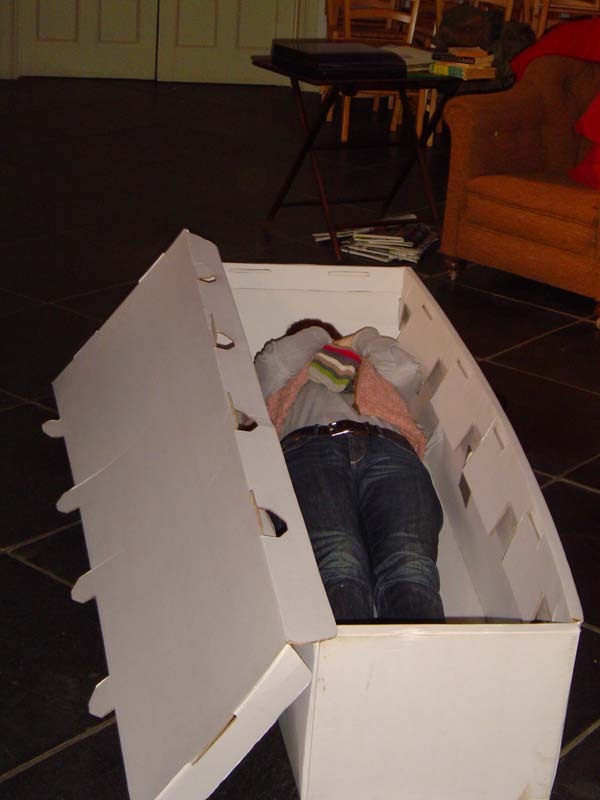 Death becomes something that can be talked about - after all when there is a flat-pack cardboard coffin that needs assembling in the living room there is no avoiding the subject. 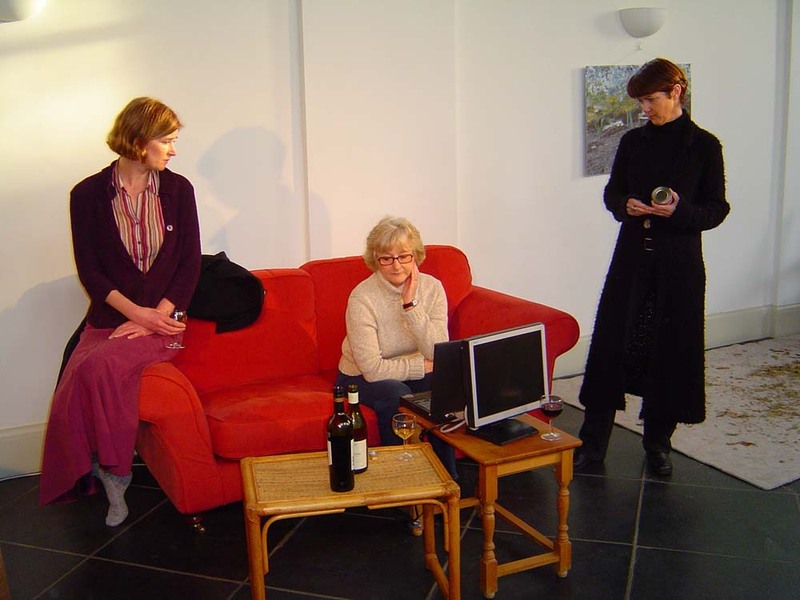 We thought the play would be ideal, because apart from the death it is about family, a dysfunctional family that finds it hard to communicate. This is very relevant in a prisoner's life, how they can't communicate with their families. "I hope it's given them some-thing to go away with, to think about. 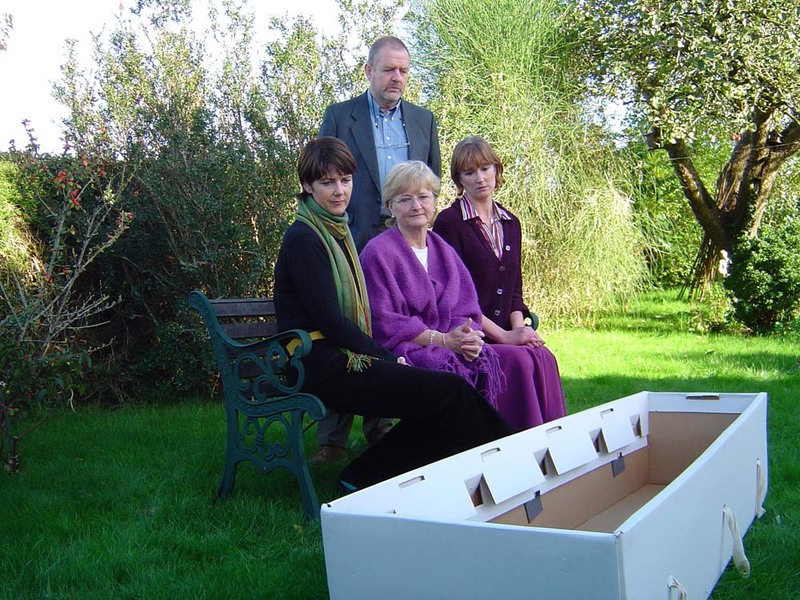 It is a thought-provoking play about relationships and death, but also about how people can change. "All the characters change in the play. It could give some stimulus to the inmates. We are all part of this local community and the prison is part of it too." 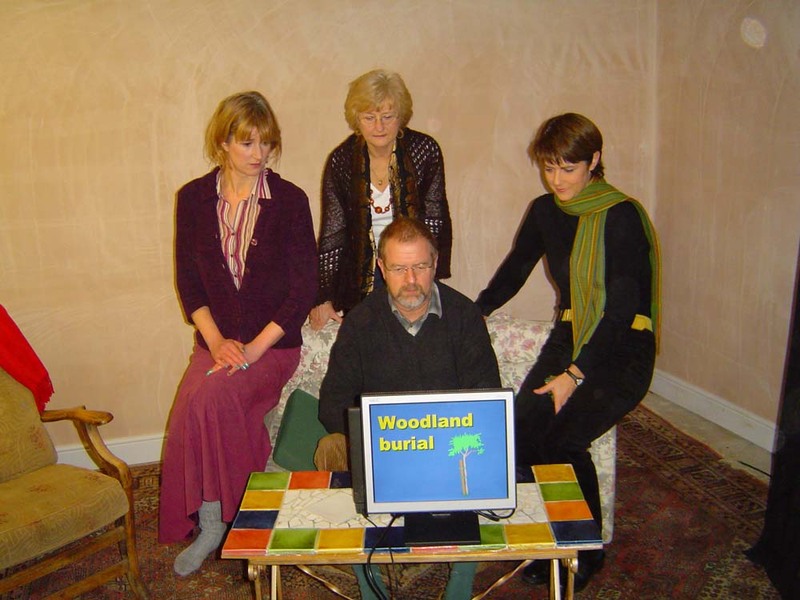 It was Taboo's fifth performance of Colder than Here for The Martinsey Isle Trust, which debuted at Child Okeford and has been performed at Springhead, Fontmell Magna. There are chances to catch it at Glastonbury in May as the next part of its planned countrywide tour, and it is hoped Taboo will confront other difficult subjects in forthcoming projects. For most of my working life I taught in a school for children with physical and mental disabilities. Several of them died very young, I had also lost my father, grandparents and sister-in-law and I thought I could cope with death. So when I went to see Colder than Here it was really to support the actors rather than for my benefit. How wrong I was! - it really had an impact on me. A very close friend was suffering from Hodgkin's Disease and the play really made me think as to what must be going through his mind and through the minds of his close family. It made me re-examine the way I approach people in terminal sickness and realise that honesty is of more help than flannel. I feel strongly that this message needs to be passed on especially to young adults. The incidence of terminal cancer seems to grow each year and at some point everyone is going to be affected by it. 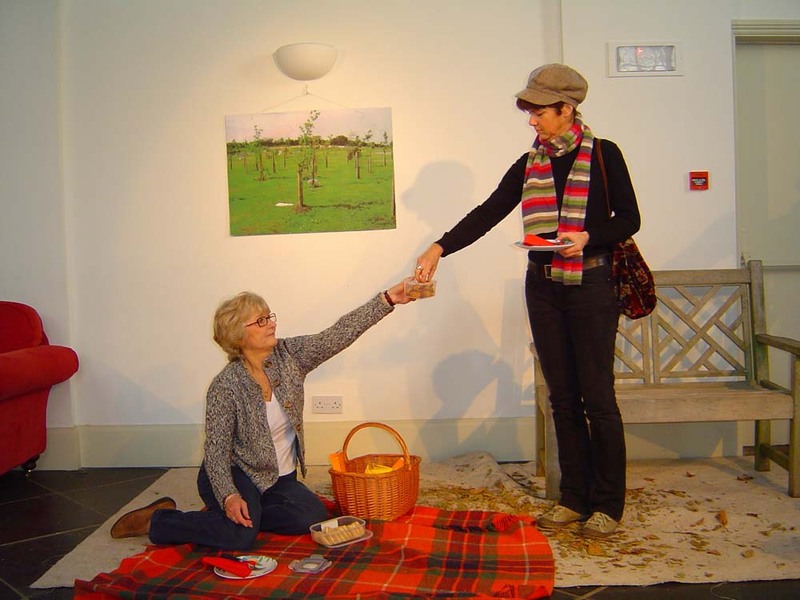 This play makes the case that illness may debilitate the body but the mind, spirit and personality of the individual are still intact and deserve to be treated with respect and dignity as a person rather than the 'does he take sugar' attitude. 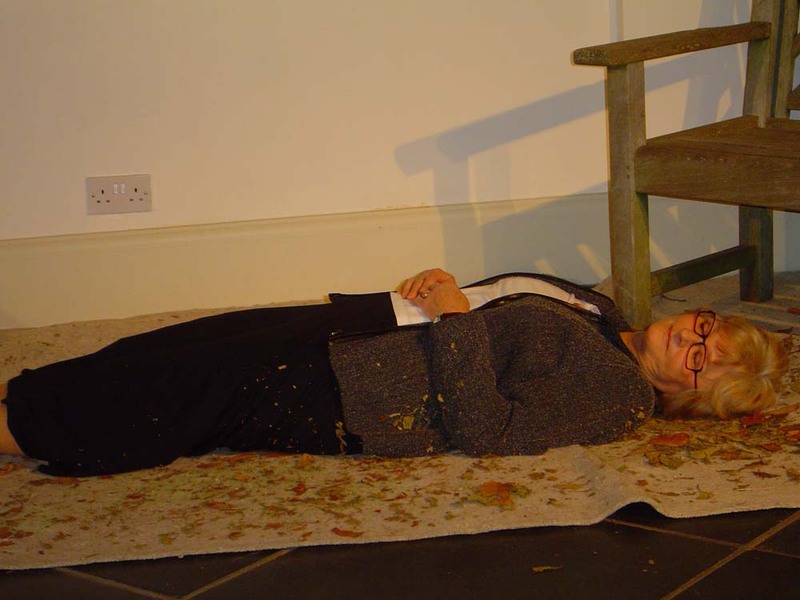 I should be very pleased to see this performance and the post-play discussion, taken into schools and 6th form colleges to help the young... to see what death can involve and be given the chance to question those taking part about their reactions to the characters and situation. The play stands on its own as a great piece of theatre that brings together family relationships in a way that many will relate to. I don't think it matters too much that the family is white and middle-class, as the themes and interpersonal relationships transcend identity. 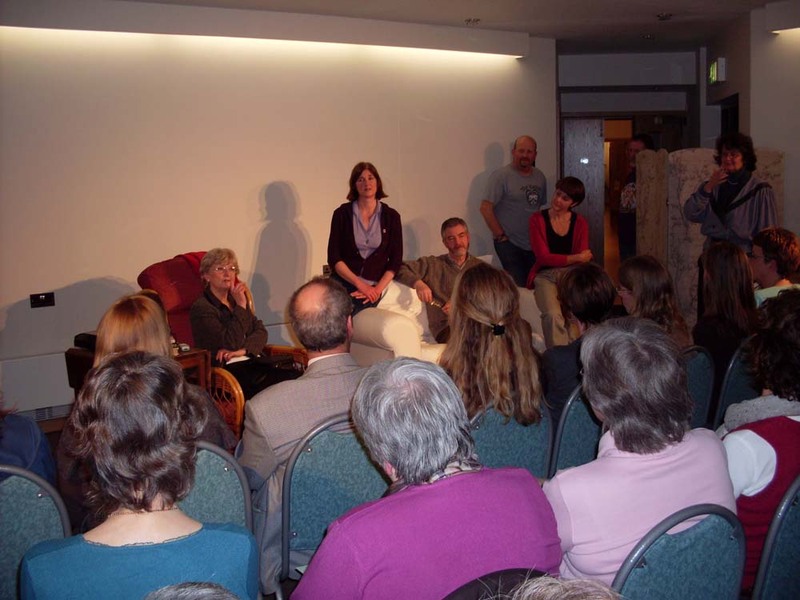 I've seen the play twice now - once in Bath with a post-discussion, and once in London with a pre-reading. I got a lot out of the pre-reading - most especially the director's passion came across really well and brought issues and relationships even more to life. I most especially enjoyed the sisters - and they reminded me of two dear friends! The characters are well rounded, and the injection of humour is welcome and well done. The ideal, I think, would be to experience the pre-reading (complete with director's passion), the play and the post-discussion/questions. To watch the play was so powerful and an amazing way to get across the impact before someone dies, and how much grieving affects families. Very good performance, so very close to how things are when a patient wants to remain at home. Well done to all concerned. Fabulous play, very moving. Certainly made me think about how different people behave and react at such a difficult time. The visual impact of the play was a very powerful learning tool. This play has such great effect. I think it really makes you realise that watching your loved ones in this situation is so hard and coping with everyday life at the same time. There is no right or wrong way to do this. 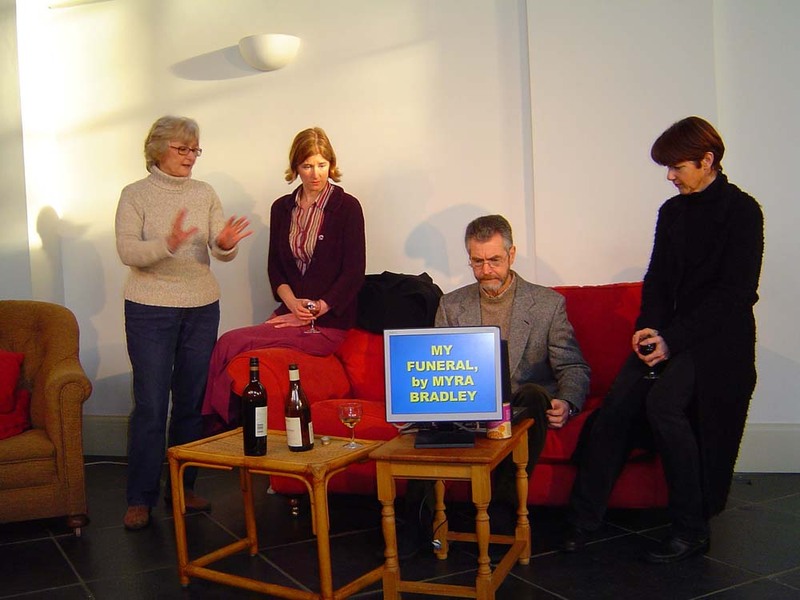 The theatre company production was very good, and highlighted many of the challenges of bereavement support. We shall be working with Jo and her team from the Lavender Farm charity, planting lavender, rosemary and marigolds for healing and remembrance. This will form the shape of a spiral, to Fibonacci dimensions, to walk in meditation and to represent the never-ending nature of the consciousness of all living things - no death. The spiral is a symbol of cyclic continuity; lavender represents the washing away of pain and suffering; rosemary and poppies are for remembrance; marigolds for healing. Please join us! Bring a spade and/or a willing heart, wellies and a lunch to share. Drinks provided - and we will have a loo! See also Dorset Lavender Farm Project. We are greatly indebted to Jo and her team for all their advice, help, hard work... and fun. The Knit or Natter group has a project connected to this: knitting flowers on a wicker spiral for the Knitted Garden project. Saturday 8th December 2013 from 2.00 pm to 5.00 pm - Children's day. (£10) - Seasonal theme. 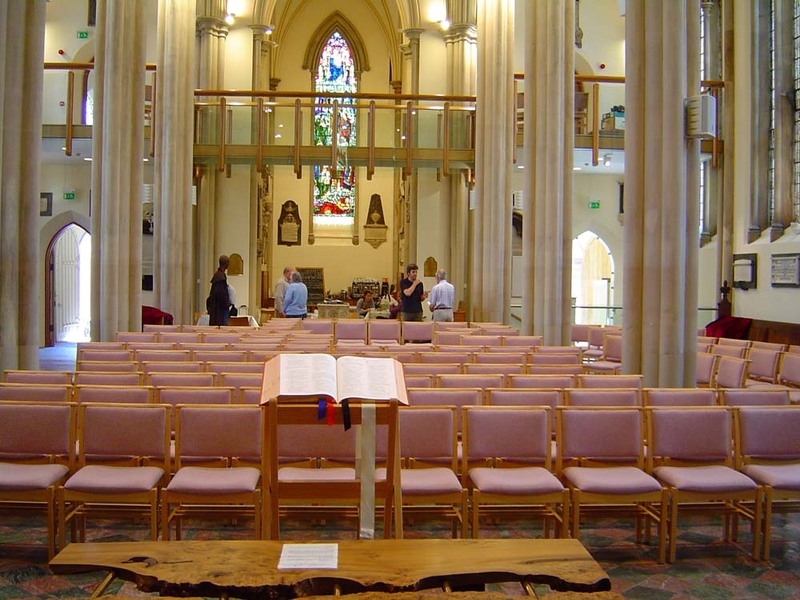 Sunday 9th and Monday 10th from 10.00 am to 4.00 pm - Adults, beginners and returners (£35 for the day or £60 for both). Min. cost £35 each day or £60 for the two to include tuition and all materials but with the opportunity to pay extra for more elaborate glass. At The Exchange, Sturminster Newton. We have CRB cover.